Purpose is to hash out the complexities of blacks and whites relations, marginalized the elements which prevent a more perfect union. We will strive to keep the discussions on blacks' treatment alive in the hope that changes will follow. Even after slavery was abolished, blacks have been subjected to the worst kind of treatment in the hands of police officers, in the criminal justice system; pretty much everywhere, bias and prejudice are used against blacks; they are barred from education, from opportunity of advancement and yet society expects a different outcome. Grievances against police brutality have fallen on deaf ears; society has long ignored their complaints. To make matters worst, society has always condoned civil rights violation by law enforcement officers. For more than half-century now, blacks have been protesting against such treatment and yet society has always moved to silence them. Has it not been for technology (the use of phone cameras) which has helped showed to the world the barbaric behavior of police officers towards blacks, our society would have continued to ignore blacks' complaints. 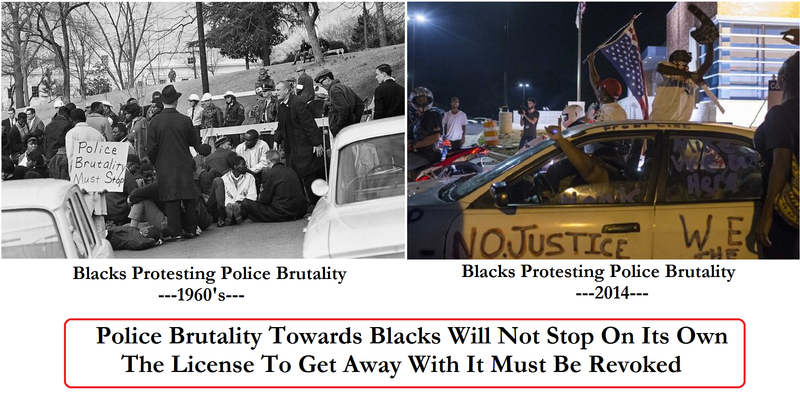 As pointed out in an article Blacks in America - https://peoplebranch.org/2016/08/02/blacks-in-america/ - Police brutality towards blacks will not stop on its own, it's the license to get away with it which must be revoked. It is within those parameters we wish to carry out the discussions towards a more permanent solution.